Highlander (1986) is a stylish fantasy directed by Russell Mulcahy, who made his bones as one of the most influential music video directors before turning his talent to film making. The film splits its story between modern day New York and various periods in the past. 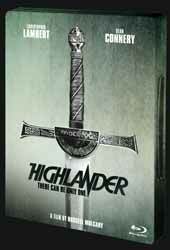 Highlander has been previously available in numerous video and DVD incarnations, but usually the print is dark and grimy. The new print for the Blu-ray is a revelation in comparison. True it’s not as good as some more modern films, but this is the best that Highlander is likely to get without a major CGI overhaul. It’s a matter of record that the film got a good mauling from the critics on its original release, it only came into its own through late night showing and video/DVD sales, until it reached cult status, which is usually a critics way of saying that they were wrong and the public loved it. The narrative is pretty straightforward; young man, who has a destiny, is born in poor circumstances, but an older, wiser, guide comes to see his destiny. The ending, as in Highlander, usually involves a last battle with the powerful object of evil. What made Highlander different was that immortality is seen pretty much as a curse by Connor (Christopher Lambert), a man who only wants to live his life with Heather (Beatie Edney), have children and grow old. Ramírez (Sean Connery) points out the uncomfortable fact that as an immortal, he cannot have children with Heather and that he will have to watch her wither and fade. Indeed one of the most powerful scenes in the movie is Connor cradling his dying love aware that everything that Ramírez said was true. With Queen providing the soundtrack with ‘Who Wants to Live Forever’ it’s a heart breaking moment. Connor is left as a lonely and reluctant hero, whose only companion is Rachel (Sheila Gish) who he rescues from the Nazi’s. That is until the film’s opening sequence when Conner gets involved in another sword fight beneath Madison Square Gardens, which brings him to the attention of the police and especially their forensic specialist Brenda (Roxanne Hart), in whom he sees a reflection of Rachel. Their developing love is both a strength, for Conner, and a source of weakness when The Kurgan (Clancy Brown) kidnaps Rachel in order to force Connor into their final confrontation. The film is presented in a non-linear fashion almost from the start as the story flits back and forth between the present and the past. Mulcahy pulls every directorial trick out, so that, apart for some period female styles, the film doesn’t seem to have aged a day. The cast is strong. Christopher Lambert brings a dark brooding presence to his role making Connor's pain a visceral experience for the audience. Sean Connery, is... well, Sean Connery, always good and always a delight to watch. Roxanne Hart pulls off the tricky role of a strong independent woman drawn to Connor's even greater strength and Beatie Edney always melts my heart as the tragic Heather who stays with Connor even though he cannot give her the children she so desires. The film does have its short comings. Just prior to the big fight scene, my better half muttered: “Hope they got rid of the wires”, just before you clearly see Connor hanging in the air on thick wires, now more obvious because of the better print. Oh well so there is a downside to high def. The film has a good set of audio options to choose from with tracks in English 2.0 Surround DTS-HD, English 5.1 DTS-HD, German 5.1 DTS-HD, Italian and Portuguese 2.0 DTS-HD and a Spanish 2.0 mono DTS-HD track. The film also has subtitles in thirteen languages. The English 5.1 DTS track is especially powerful, but they all do a good job, especially with the material from Queen. The print is presented in an aspect ratio of 1.85:1. For extras we have a few German featurettes, in English, which can be viewed individually or as a single piece. A legend is Born (29 min, 11 sec) has an extensive interviews with Gregory Widen, who wrote the original script as a college assignment and Peter Bellwood who re-crafted the script for the final movie. Both men discus the changes that had been made, why they had to be made and how they thought about the final product. The Visual Style (40 min, 01 sec) with Gerry Fisher (cinematographer) and Allan Cameron (production designer) going through how the film was staged and shot. Lastly A Strong Woman (15 min, 53 sec) with Roxanne Hart talking about her involvement in the film. Next up is the quickest interview I think I have ever seen, I don’t mean it’s short but in Christopher Lambert’s Interview (8 min, 26 sec) he talks so quickly that my head swam; this is, for anyone else, a twenty minute interview sped through in less than ten. The film does boast an insightful full length commentary from the director, who also bemoans the visible wires, and the disc rounds off with some deleted scenes (6 min, 14 sec), which unfortunately do not have their original audio track so they have been set to music and the original theatrical trailer (2 min, 31 sec). I’m not sure what’s not to like about the film. Okay I have always had a gripe about the final fight which has spoilt the film for me over and over. The parts of the film which has been scored by Queen are a delight. The final fight scene, however, has music which goes a long way to spoiling it; I can even forgive the noticeable wires. For some reason the score peaks too soon and what you have is this one overlong crescendo, which rather than enhancing the scene has the effect of draining it of any power. Still that’s my only gripe and it’s a small one. There are many things on the plus side for this film, but special mention should go to Clancy Brown (Kurgan) who creates a villain you love to hate, he delivers two of the best lines in the film. If you haven’t seen this film before, go and get it. If you’ve been used to watching your old muddy DVD copy do yourself a favour and buy this high def version.